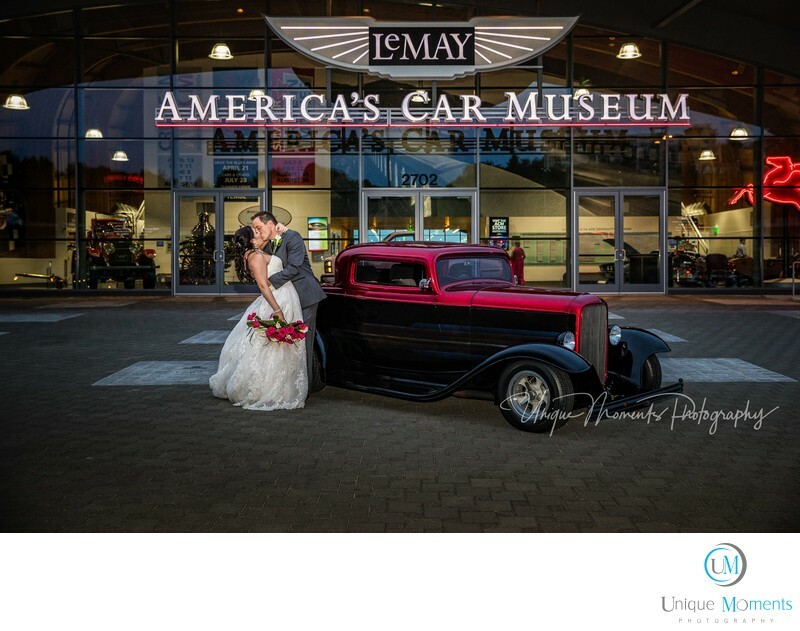 Unique Moments Photography, a Tacoma based wedding photography company from Gig Harbor WA, traveled to America's Car Museum to capture a very special and Unique wedding. The Lemay car museum is a must see for anyone who appreciates classic cars. It has everything that was built that has 4 wheels and rolls down a Highway under its roof. Absolutely an amazing venue to go visit. We met the couple at the Brides Club bridal show at the tacoma dome. Lemay car Museum is right across the street from the dome. We knew in a second that that we wanted to capture this wedding. The clients are classic car and Hot Rod car owners and when our groom told me he was bringing this car for pictures, well, we practically begged them to hire us. Turned out to be one of the best weddings for the 2017 season. Its a cant miss venue for photographers and the balcony has the best view of the Tacoma water front in the entire City. We love America's Car musuem and would go back in a heartbeat. Location: 2702 E D St, Tacoma, WA 98421 .